My favorite moment of E3 so far is the curtains lifting, the panels of a walking board lighting up one by one and Hideo Kojima, gaming genius jilted by Konami, descending them. “I’m back!” he uttered, which is all he needed to say. And apparently, he had enough time between his firing and now to pitch an entirely new game AND have a CGI rendered trailer finished by this point. The last project Kojima worked on for Konami was “Silent Hills,” a revamp of their survival-horror series that only saw the light of day as a demo called “P.T.” before Konami turned rotten and cancelled everything. Actor Norman Reedus was scheduled to provide a voice for this game. Kojima liked him enough to call him again. 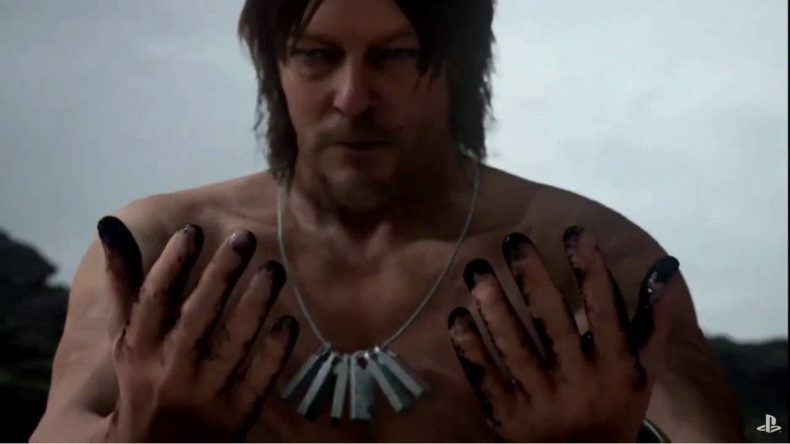 Reedus is the marquee star of “Death Stranding,” Hideo’s new game in which……well, we don’t know anything about it yet, and the esoteric trailer we got tonight doesn’t help. Reedus is naked on a beach surrounded by dead crabs, and then there’s this baby he finds and happily embraces, then the baby turns invisible and crawls away, then Reedus notices his hands are covered in oil, so he stands up and stares into the distance at five flying figures coming his way. Any ideas what that was all about? But what were you expecting from Kojima the Riddler — a coherent trailer? “Death Stranding” will be a Playstation exclusive, and may support Playstation VR if that device is alive by then.